Smarton has a lifting capacity of up to 250 tonnes. 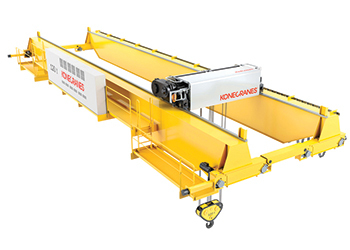 Konecranes has further developed Smarton, its heavy-duty overhead crane, by adding more high-tech features to it. The revamped crane is designed to make lifting particularly in demanding processes, assembly and maintenance operations as safe, smooth, and efficient as possible. The latest updates have been geared specifically towards improving the user interface for crane operators, customer service crews, and management. “The Smarton includes smart features and Truconnect Remote Services, available to improve safety and productivity of the customer’s lifting processes,” says Tero Jaakkola, product manager. The new Smarton includes a tablet, which can be mounted to the radio controller or in the operator’s cabin. The tablet makes crane operation easier and more productive, as the operator receives crane- and process-related information directly to the tablet and is able to make adjustments to the crane. For maintenance purposes, the Smarton tablet provides advanced troubleshooting and condition information of the crane controls. Smarton is a built-up, heavy-duty overhead crane for demanding processes, assembly, and maintenance use. It has a lifting capacity of up to 250 tonnes with a single trolley and up to 500 tonnes with two trolleys. The crane’s speed range is wide, and duty classes range from M3 to M8. Konecranes has sold Smarton cranes since 2009 to 48 countries, including the Middle East. The main industries using the crane are paper, automotive, power, and steel, as well as other customers from general manufacturing and mining. In its basic form, Smarton comes with many standard features that will benefit the customer’s production process. The use of the latest smart features, such as snag prevention, hook centering, and active sway control, help improve speed, accuracy, and safety.